Cellulitis refers to bacterial infection of skin, which presents with redness and swelling of the affected parts of the body. The person may also feel softening of skin and hot sensation or tenderness on touch. Cellulitis is a commonly occurring painful infection which may prove life-threatening without timely interventions. Cellulitis most frequently involves lower legs but it may occur anywhere on the body. Although infection is mostly restricted to superficial layers of skin, in some cases damage may spread to underlying tissues as well. Cellulitis may also spread and affect bloodstream and lymph nodes. 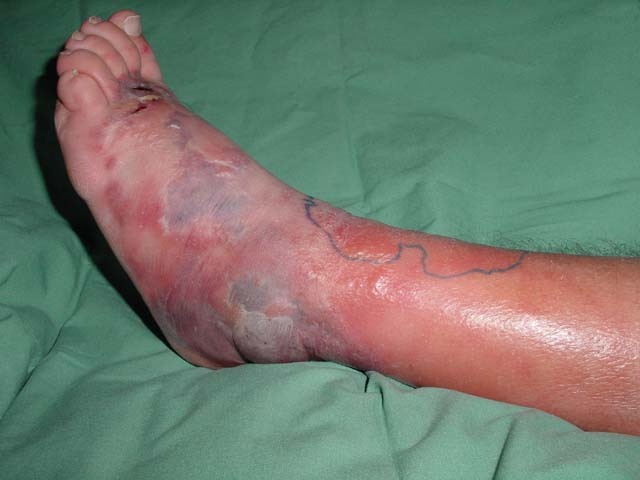 What Cause Cellulitis of the Legs? Bacterial colonization is the most common cause of leg cellulitis. In vast majority of cases, infection is caused by staphylococcus aureus, followed by streptococcus. When the cellulitis is caused by strep, it is referred to as erysipelas and can be identified by spreading of hot and bright red patches all over the involved skin. The patches are distinct for raised and sharp boundaries. If your cellulitis is due to a cat or dog bite, then Pasteurella multocida can be the culprit. These bacteria have a limited incubation time of 4-24 hours. If the cellulitis is caused after an injury from shellfish or saltwater fish then the bacteria responsible is Erysipelothrix rhusiopathiae. Cellulitis can also be caused after skin injury on farms, particularly if you work in poultry with pigs. Leaking of pus or other yellow fluid. Cellulitis can be easily treated with a seven-day antibiotic course. When you start the course, symptoms start to relieve, but the redness may increase transiently. And a follow-up visit can be asked by your doctor after taking for a few days, but if the infected area is expanding continuously then you may visit your doctor early.Some germs may resist the antibiotics, so speak to your doctor if you don't see any improvements. Also, visit your doctor if the pharmacological regimen doesn't suit you in any way. If your cellulitis is mild but unable to improve or if the infection is widespread, you may require intravenous antibiotic treatment in an injection form. It can easily be done at home, but some cases need the help of the professionals, especially when cellulitis in the legs is severe. Along with reducing the pain, swelling can be relieved by elevating the affected body part. You can keep doing this until the infection clears out. Keep your leg raised by keeping it above the hip and let gravity to do its wonder; keep your ankle higher than your hips for effective results. Chair or stool may not be good options, instead lie on the sofa while keeping the heels upwards on the arm of sofa with no pressure on calf. You can also lie on sofa while keeping your leg over a couple of cushions. Alternatively, place your leg on some pillows to keep it higher than the hip on bed. Or you can empty a drawer and place it underneath the mattress on the foot's side. There are some recommended supplements can be taken to help strengthen the immune system and heal the skin. But always contact your doctor before taking any supplement. Vitamin-C: Adults can take 1000mg for 2-6 doses a day for short time. Considering that it can interfere with antibiotics positively including blood thinning medicines, and a few chemotherapy agents, you just don't start using without asking your physician. Vitamin-E:You can take for 400-800 IU each day. Zinc:Recommended amount can be 30mg/day. Probiotic supplements: Physicians recommend 5-10 billion colony forming units(CFUs) per day for better immunity. As antibiotics can cause diarrhea; taking these supplements can restore the bacterial imbalance. You must ask your doctor before using probiotic supplements, especially if you have a weak immune system. Some nutrition like flavonoids helps reduce the risk of cellulitis and reduce lymphedema. But quercetin is a flavonoid in the form of supplement that can interfere with medications and high doses can damage your kidney so always ask your doctor before choosing the nutrition. Most cases don't require surgery for cellulitis in the legs. The method of surgery includes opening and draining the abscess, removal of pus collection from the tissue or excising the dead tissue for optimal healing. Have plenty of rest to give your body the energy to fight against infection. Use pain killers like paracetamol. If you're at home, maintain follow-ups with your doctor within 1 or 2 days to make sure that there is improvement in the cellulitis. At first you should know that cellulitis isn't contagious at all. As it is an infection on deeper layers of skin, it gets covered by the upper layers. It is different from impetigo, which is more superficial and contagious. If your skin has any wounds or cuts, keep them clean by washing thoroughly and use an antiseptic cream. Keep the wound covered with bandage/plaster but don't forget to change it regularly. Keep your skin moisturized as dry skin can get cracked easily which results in entering of bacteria into the skin. Regularly use a moisturizer for your skin. Don't scratch your skin, scratches make the skin itchy and can let the germs enter into your skin. If you have long finger nails, cut them short and try to avoid scratching the skin. If you have an experience of cellulitis of the legs or at any other area of body, then doctor may suggest a long term course of antibiotics of low dose. It will help in reducing the future appearances of cellulitis. Can One Die of Lyme Disease?